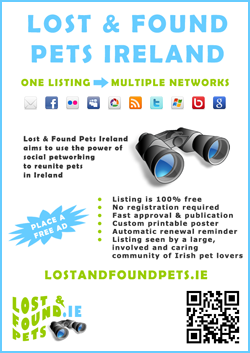 Over the course of the past 6 months it has become apparent that while all the tech and social media facilities for sharing listings are all very well and good, often the most effective means of getting pets reunited with owners is via the traditional lost and found pet poster. 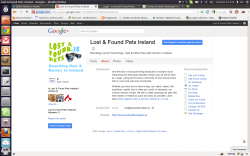 Indeed it was the way I managed to locate the owner of the dog I found myself which inspired this website. Since we launched we have offered a facility on the site to print out a custom lost or found pet poster you can distribute locally but now we are bringing a little tech from the website right onto the poster by including QRcodes. These codes work a little like barcodes – with a suitable application on your phone, you can point your camera at one and the information contained within is transferred automatically to your phone, whether it be (as in the case of our posters) a web address to store on your phone, a phone number to dial or just a simple text message. So today we score another first as these barcodes have gone live on all posters and you can view and test an example above which contains simply the web address for this site. Depending on the make and model of your phone, there are a number of (usually free) scanning applications available. I have listed some below for your convenience.